Buildings in the commercial and institutional sectors account for almost $17 billion in annual energy costs and they produce 13% of Canada’s carbon emissions. This has stimulated a growing emphasis on establishing energy efficient and sustainable building practices. As the shift towards greener buildings gains ground, building operators represent an essential piece of the puzzle. 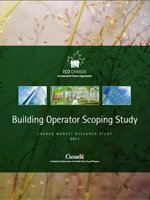 The Building Operator Scoping Study explores clearer definitions of the occupation and further support mechanisms necessary to assist building operators in adapting to sustainable building requirements.